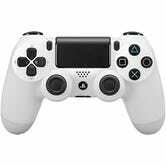 The White and Urban Camo DualShock 4s are also up for preorder. Still need a Playstation 4? Grab one today with inFamous: Second Son and 3 months of Playstation plus thrown in for free. Even valuing Second Son at $40 instead of full price, that's the best PS4 deal we've seen. We recently wrote about some interesting new solutions to charge all your new controllers , so check that out if you missed it. We also covered a battery pack that will double your DualShock 4's battery life .